Discovered in 1787 by Caroline Herschel, NGC 7380 is the open star cluster embedded within the emission nebula known as the Wizard Nebula. 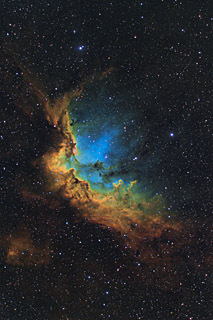 The stars within the cluster were formed from this surrounding nebula. 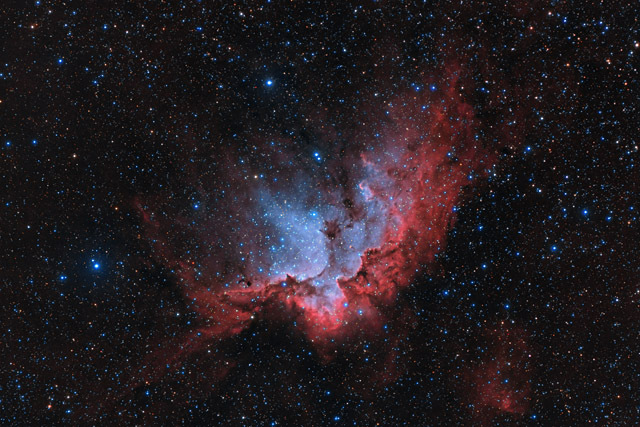 Covering about a half a degree of sky (about the same as the Full Moon) in the constellation of Cepheus, the nebula shines brightly in the red light of glowing Hydrogen gas. There is also a strong Oxygen III component, showing in this image as a light blue color. SQM Reading Bortle 4 on all 8 nights, typically 21.40 to 21.60. Some narrowband data captured with Moon up. Notes I ended up employing a number of new techniques with this image. The biggest experiment was the use of a Red Continuum filter. What this filter does is to capture 5nm of red data that is just a little bit shorter wavelength than the 5nm of red that is center on the Hydrogen Alpha filter. The net result is that I can use this filter to subtract from my Ha data all of the light that is continuous throughout the red spectrum. The net result is ONLY the Ha data, free of stars or other non-Ha data. I can also use this method with my SII filter. The beauty of this technique is that it allows me to isolate the Ha and make for a cleaner blend of data. I can also use it to stretch the Ha data more aggressively without bloating the stars. I'm still developing my methods for combining my narrowband and RGB data. While I'm improving with these skills, I still am ending up with some minor artifacts, mostly around the stars. Eventually I hope to master some better techniques for blending these more cleanly. Nonetheless, I'm generally pretty happy with this astrophoto, as I ended up with some nice overall color and a lot of fainter nebulosity. This image was published by Astronomy Magazine as its Picture of the Day for February 27, 2017!